At the UFC 223 Media Day on Wednesday in Brooklyn, New York, MMANews.com’s own Fernando Quiles Jr. caught up with several fighters scheduled for this Saturday’s big pay-per-view for exclusive one-on-one interviews. 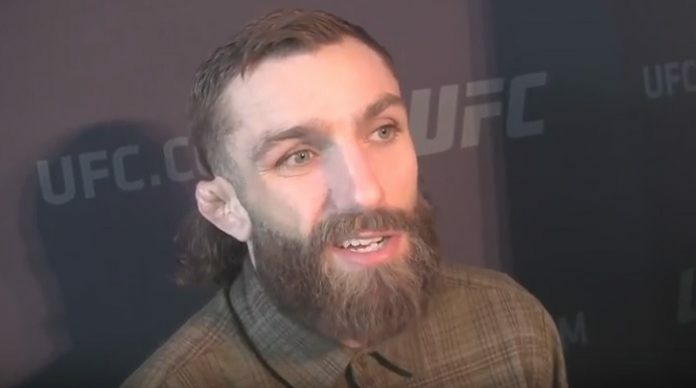 Among the fighters Quiles Jr. spoke with was UFC Lightweight contender Michael Chiesa. “Maverick” Chiesa has been all over the headlines on Thursday following Conor McGregor’s crazy guard rail / bus incident, as he was on the bus when the window was smashed from “The Notorious” one attacking it. Chiesa suffered multiple cuts as a result of the incident, and is being treated at a local hospital in Brooklyn today. One of Chiesa’s coaches, John Wood, went on the record saying it is “50/50” right now regarding whether or not he will still be fighting Anthony “Showtime” Pettis at UFC 223 this Saturday. Prior to the incident, Chiesa broke down his scheduled fight against Pettis in great detail, looking at the fight from all angles. He made it clear that despite buzz from the MMA community about the potential Chiesa-Pettis has to steal the show, he is not going into the fight looking to put on a “Fight of the Night” performance. Additionally, Chiesa (14-3), who is currently ranked number nine in the UFC Lightweight division, addressed the talk that “Showtime” Pettis (20-7) is past his prime. The former Wheaties poster boy, who sits at number 12 in the current UFC rankings for the 155-pound division, will be coming into the Octagon with a 2-5 record in his last seven fights. In response to those who feel that Pettis is settling into becoming a one-dimensional fighter as his career has progressed, Chiesa was quick to remind everyone that “Showtime” is absolutely talented on the ground. Check out Fernando Quiles Jr.’s complete interview with Michael Chiesa via the official MMANews.com YouTube channel below, and make sure to continue visiting MMANews.com throughout the week for continuous exclusive content coming out of Brooklyn, New York. Headlined by Khabib Nurmagomedov vs. Max Holloway for the UFC Lightweight Championship and featuring the Namajunas-Jędrzejczyk 2 fight, UFC 223 goes down from the Barclays Center in Brooklyn, New York this Saturday night, April 7th, airing live on pay-per-view. Make sure to join us here at MMANews.com and on Twitter @mmanews_com this Saturday for complete round-by-round results coverage of the big event this weekend. What are your thoughts on the Michael Chiesa vs. Anthony Pettis fight at UFC 223? Do you think the fight will even make it to the Octagon after the Conor McGregor / bus incident.